Today was a wonderful day to take a drive to the North Shore. Why? Because it was a holiday and I didn't have to go to work...because it was a nice sunny day...and because I had some out of town guests. So I decided to take them to eat at Giovanni's in Kahuku. Now this place has no real address. Well then how exactly do you find it? Just keep driving down Kamehameha highway, past the Polynesian Cultural Center (if you're coming from the Windward side) until you see the sign. Ask any local about this place and most will tell you that it serves the best shrimp scampi around! I do have to agree that it is one of the best, and the added bonus is that it all comes from a grafitti covered truck. Now this place is not exactly known for it's decor. A few plastic picnic tables under a couple of tents...definitely not enough space to seat everyone who comes here. Here's a look at the crowd that's just beginning to form when we arrive at 12:15 pm. We were lucky that there was only one person in line ahead of us. As I approached the truck to order, I glanced at the menu...still the same 3 items that I remember! Well, I was going to order #2, Hot and Spicy shrimp (read below..."super hot, NO REFUNDS!! "), but was told that they only had #1, Shrimp Scampi today (US$11.00). So that's what I had with hot sauce on the side. As I waited for a table to become available and for my number to be called (I was #235, when we got there they had just announced #229), the people started to arrive. In a matter of minutes a whole throng of people appeared! What I got was 2 scoops white rice topped with a bit of scampi sauce, a lemon wedge, and half a pound of shrimp scampi served in the shell. I had 12 pieces of shrimp and it was delicious! The shrimp was fresh and done just right (not overcooked!) and the sauce was buttery and full of garlic! Sinful? You bet, but worth every mouthful! The only let down was that the side of hot sauce was not hot at all! It seemed like some generic hot sauce mixed with melted butter. Hopefully the next time I come here they have the hot and spicy, otherwise, I'll just have to make due with the shrimp scampi which isn't a bad consolation after all. I worked at the truck. 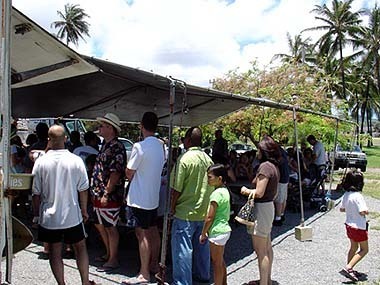 Want the real original shrimp truck recipe? here's what is in it..
olive oil, chopped garlic,(not minced garlic cause minced garlic will burn and the choped garlic sticks to the shells) salt, pepper and one other ingredient. that's it... no matter what you hear, no sugar, wine, vinegar, or lemon are used. email me for the final ingredient!! Also, the shrimp at most of the shrimp trucks is not local shrimp. It hasn't been for years. How could those small shrimp farms support all those plates? It's frozen, imported from LA, CA. This place ROCKS! It is so great. 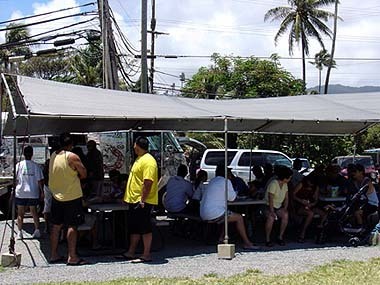 hey wassup been there and had that, the best shrimp by far, perfect taste at the little truck, haleiwa is the best to, good eats with good beaches and best people in hawaii is the best recipe for anyone. get it if you can. il try to replicate but will probably not be succesful. 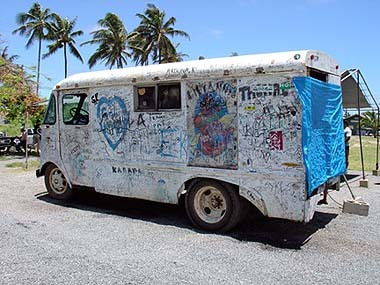 anyway congrats to da kine at the little white truck at haleiwa. Need to order bottles of shrimpscampy sauce. Who do I call? On one of my vacations I once jumped off THE BUS on my way around the island because I could smell the truck at least a block away. I cannot pass by Giovanni's truck without stopping. 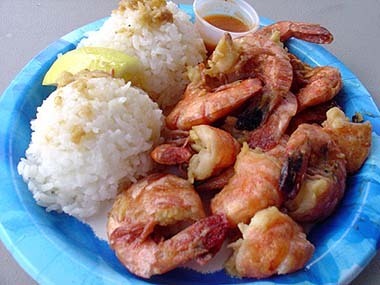 I live in Chicago, and whenever I dream of Oahu, I dream of that shrimp. It is out of this world, the best I ever had! Wow what a flashback!! 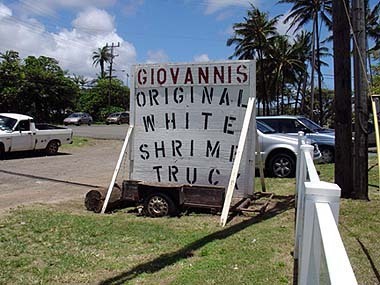 I was living on Oahu back in 97 (to 2000) and had eaten a Giovanni's Shrimp Shack often.. Loved the Hot, and I do mean hot (made my eyes water and my nose run)!! style, #2 I think. I was looking to get another tee shirt with the logo on it when I came across this site.. Sorry to see everything went sour, , too bad for all those folks that never got a taste of heaven.. (and too bad I can't get a tee shirt!! lol).. 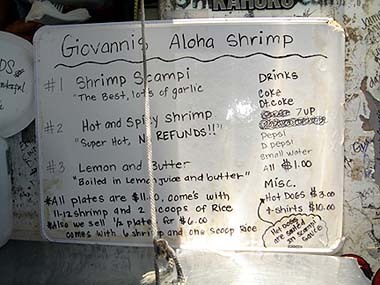 I've been to both Giovani Shrimp Truck and the Romy's Shrimp Stand a mile away and I have to tell you that Romy's has much better tasting shrimp. Don't try that Thai food next to Giovanni's! My friend had to spit it out! What a waste of money and time. I like the snack bar at PCC. Try the Moari Magic. You don't have to pay admission to go to the snack bar.